In technology class throughout the month of March, our 2nd, 3rd, and 4th grade classes did hands on activities to learn about the engineering process. 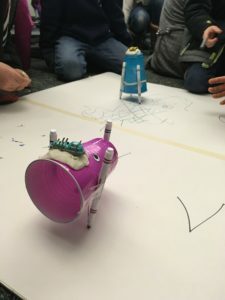 In 2nd grade, the students were given supplies to design and build their own “marker-bot” – a self-drawing robot powered by hex bug robots. 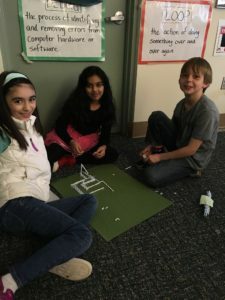 Our 3rd and 4th grade students designed and built mazes for hex bugs. We started these lessons by talking about engineering and what it means to be an engineer. 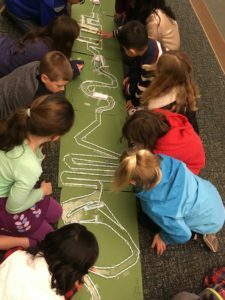 Using an engineer who builds bridges as an example, we walked through the engineering process: define the problem, learn, plan, build, test, and iterate (make changes and keep testing as needed). After defining our engineering tasks, the students got a chance to learn by using some existing marker-bots and mazes. They learned what works well (and what doesn’t! ), then went to work in small groups to plan and design their own. The students worked in small groups of 3-4 students to implement their designs. Once they were finished building, we talked about testing their designs. Testing is a vital part of the process as it’s designed to find any problems. With the marker-bots, our 2nd grade students found problems as they tried to draw and made changes to have a successful test of their marker-bot. Our 3rd and 4th grade students had a worksheet full of test cases they had to execute to test the robustness of their maze. As they found problems, they made changes and kept testing until their hex bug was successful. Our last step was to combine our mazes. This was exciting for all of the students! They had fun cheering for the different hex bugs as they raced from one end to the other. Our King’s Elementary students came away from these projects with a new appreciation for the steps involved in building and had fun creating their own engineering projects! Rhonda McRae is the technology teacher at King’s Elementary. 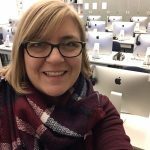 She has a passion for teaching students learn how to create technology and not just be consumers of technology.